James William Barclay son of George Barclay builder of Cults Aberdeen was educated at Aberdeen Grammar School and Aberdeen University. He started work as a grain merchant in Castle Street and subsequently became a ship-owner. Prior to that, he had represented the 1st Ward in Aberdeen town council from 1864-1867 and the 3rd Ward from 1868-1871. He was a ship-owner. He stood as a second, but unsuccessful Liberal candidate in the 1872 Aberdeen by-election, caused by the death of the sitting MP, Col. Sykes. John Farley Leith, also a Liberal, was successful. It is not at all clear to me why Barclay stood against another candidate who was of the same party. In 1873 Barclay ultimately succeeded in becoming an MP, but in a different constituency. He was a Member of Parliament for Forfarshire in 1873 and appears to have held his seat for some considerable time until 1992. He supported the tenants’ rights movement. This election poster (above) asks the Aberdeen electorate to support the Liberal candidate James W Barclay, rather than the other Liberal planning to stand in the city, John Farley Leith. Farley Leith was returned as the Member of Parliament for Aberdeen in the 1872 by-election. James Shaw was the Tory candidate in the 1872 by-election, brought about by the death of the MP Col Sykes. Both John Farley Leith, whom Shaw attacks here, and James Barclay, stood as Liberal candidates. John Farley Leith won. Description: This song is addressed to James William Barclay (1833-1907). 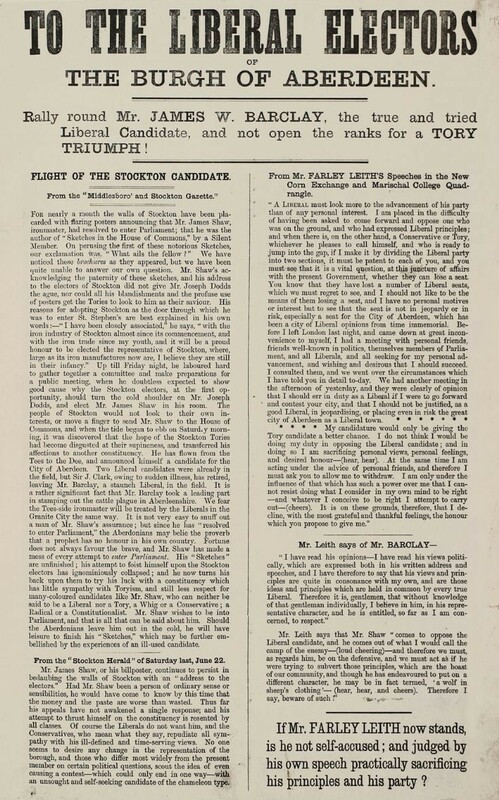 Barclay stood as a second, but unsuccessful Liberal candidate in the 1872 Aberdeen by-election, caused by the death of the sitting MP, Colonel Sykes (referred to in the last verse). John Farley Leith (referred to in the final line, also a Liberal, was successful. Barclay became MP for Forfarshire in 1873. Tune "Will Ye No Come Back Again"
Hae gane to coax him back again. Was will ye no come back again? Wou’d ye just now come back again. Although ye stuck to Cobden’s tail. They’ll gladly greet you back again. Or China Silks, or Yorkshire bales. Means green cheese until ye explain. Langsyne,” to our respect lays claim. Were ye among the Chinamen. Or Sykes, cam’ wi’ them by the train. For you, send FARLEY back again!